The adult Bewick's Swan, six Dunlin, a first-winter Little Gull and three Black-necked Grebes remained, although with the amount of disturbance again today it's a wonder there are any birds remaining on the lake at all. Three Little Gulls, two Mediterranean Gulls, one Bewick's Swan, three Black-necked Grebes, one Dunlin and a Little Stint were seen today, but the duck flock was mobile and spent a lot of time at long range along the East Shore due to heavy disturbance today. The channel at Herriott's Bridge produced three Water Rails, three Green Sandpipers (another five were on Heron's Green Pool) and a Kingfisher late this afternoon. A day total of of 50 Skylarks, most of which passed this morning was a decent number for Chew. The Little Egret count nudged up by one to 23, otherwise the birds were similar to the last few days: three Little Gulls, five Golden Plover, two Ruffs, one Black-tailed Godwit, one Knot, one Little Stint, two Dunlin, two Green Sandpipers, one Snipe (continuing poor numbers), one Jack Snipe, three Goosander, one male Ferruginous Duck, one male Ring-necked Duck, three Black-necked Grebes, the male Red-breasted Merganser, two Water Pipits and three Fieldfares. A Little Stint and a Knot were new today; other birds were similar to the previous few days - two Jack Snipe (on the pool in front of Stratford hide), four Little Gulls, one Ruff, three Dunlin, four Green Sandpipers, one Ruff, one Black-tailed Godwit, a whopping 22 Little Egrets, 55 Goldeneye, 250 Cormorants, two (male and female) Ferruginous Ducks, the male Ring-necked Duck, one Red-breasted Merganser and three aythya hybrids. A Bittern showed well at Herriott's Bridge this evening in the north-east corner before flying across the pool. Some new arrivals today were 20 Golden Plover on the shore at Herriott's End and four Little Gulls (different to yesterdays group). Otherwise, as follows: 50 Meadow Pipits, two Water Pipits, a few Skylarks overhead, 10 Linnets, one Grey Plover, 18 Little Egrets, three Black-necked Grebes, two male Ferruginous Ducks, one male Ring-necked Duck, one male Red-breasted Merganser, three Goosanders, a first-winter male Red-crested Pochard, one Black-tailed Godwit, one Ruff, nine Dunlin, eight Green Sandpipers, two Snipe and a male Ferruginous Duck x Pochard. Six Little Gulls at Stratford and a male Red-crested Pochard were new-in today. Six Black-necked Grebes were still present, as was a male Ferruginous Duck, two Ferruginous Duck x Pochard-types, three Dunlin, two Water Pipits, two Ruff and the male Red-breasted Merganser. A female Ferruginous Duck (the fourth of the autumn) was at Moreton today, and a male was in Stratford Bay. Also present were five Black-necked Grebes (Moreton), a Ruff (Heron's Green Bay), four Dunlin and a Water Pipit (Stratford Bay). An adult Spoonbill was a brief visitor to the lake this afternoon; seen on Little Denny it was then watched flying high over the lake until it settled for ten minutes or so on the east side of Stratford Bay. It then left the lake west towards Blagdon, and passed Blagdon Lodge about 25 minutes later, becoming the first ever to be recorded at the lake. It was a bit of a surprise that it took that long to get there - perhaps it stopped for a snooze on the way? Also at Chew today - three Black-necked Grebes (Moreton), one Little Gull, 19 Little Egrets, 290 Lapwing, one Grey Plover (Spring Bay), three Dunlin and two Black-tailed Godwits. Adult Spoonbill. Honest. Taken at a distance of about 700m. The adult Bewick's Swan was relocated at Denny/Twycross this morning, and a Bittern was seen in flight over Herriott's Pool this evening. A first-winter Little Gull was in the centre of the lake and four Black-necked Grebes were at Moreton amongst the mats of vegetation with the ducks. Other birds included a Kingfisher, 13 Skylarks, four Water Pipits (Moreton), one Ringed Plover, c.20 Meadow Pipits and two Black-tailed Godwits. Today around the lake - six Black-necked Grebes, two Goosander, one Red-breasted Merganser, two Black-tailed Godwits, one Dunlin, one Little Gull, one Water Pipit, two Peregrines, two Green Sandpipers, one Wheatear and ten Redwing. A Ruff was still in Heron's Green Bay. Two Jack Snipe and a Common Snipe were on the pool in front of Stratford hide this afternoon, amongst the reeds on the far side. Also present from Villice to Stratford were two Black-tailed Godwits, two Goosander, one Ruff, three Green Sandpipers, four Black-necked Grebes, 19 Little Egrets, and a splendid total of 441 Wigeon. By my reckoning that's the highest count since January 1997. A Bewick's Swan arrived in Stratford Bay this afternoon but was quickly seen off by the local Mute Swans. It doesn't show on the photo, but this one almost went right down to the shoreline in Stratford Bay. Not quite a proper doubler though. The first Jack Snipe of the autumn appeared in front of Stratford hide this afternoon; another good wader find was a Grey Plover in Heron's Green Bay. Otherwise, as follows - two Ferruginous Ducks, one Ring-necked Duck, six Black-necked Grebes (equal highest CVL count), 16 Little Egrets, one male Red-breasted Merganser (Herriott's End channel), one Ruff, one Black-tailed Godwit, four Green Sandpipers, one Peregrine and a Wheatear. Still two Ferruginous Ducks, the Ring-necked Duck, the male Ferruginous Duck x Pochard and five Black-necked Grebes, along with 15 Little Egrets, one Red-breasted Merganser, two Goosander, two Black-tailed Godwits, one Ruff, 243 Cormorants, two Peregrines, two Water Pipits and one Wheatear. Another one for the large Peregrine crop collection. The two Ferruginous Ducks and a Ring-necked Duck were still present, although the aythya flock seems to be not quite so large as it was a week or so ago. An eclipse male Red-breasted Merganser probably is the usual bird returning (rather than the early one last month which may have been the one currently at Cheddar). Other birds - 18 Goldeneye, one Black-tailed Godwit, one first-winter Mediterranean Gull, a juvenile Peregrine, five Black-necked Grebes and one Water Pipit. A few new birds this afternoon - nine Goldeneye, two Goosanders and a Ruff. One Black-necked Grebe remained, and at Heron's Green Pool early this morning were three Whinchats, four Water Rails and two Green Sandpipers. Evidently little on the move in this fine weather...two Ferruginous Ducks, one Ring-necked Duck, five Black-necked Grebes, one Little Gull, one Mediterranean Gull and two each of Black-tailed Godwit, Ringed Plover and Green Sandpiper. Stratford hide this afternoon produced four Black-necked Grebes, two Ferruginous Ducks at least one Ring-necked Duck, two Black-tailed Godwits and one Little Gull. Still one Ferruginous Duck and the Ring-necked Duck present today, although wader numbers are clearly dropping off now (not that they were anything to write home about anyway). Other birds - four Black-necked Grebes, one Goldeneye, two Ringed Plover, two Black-tailed Godwits, one Green Sandpiper, three Redwing, a Little Gull and a flyover Rock Pipit. A slightly reduced report today - my correspondent described challenging conditions as 'Shite. Cold. Distant'. Two Ferruginous Ducks, one Black-necked Grebe, two Ringed Plover, two Curlew Sandpipers and two Redwing. The monthly WeBS count took place today, producing a remarkable total of 13,047 birds; over 3200 more than last month. Needless to say, the water level has a big effect on the number of birds at the lake, and in addition to the figures for this month, Rupert has kindly provided corresponding counts for October 2008, when the total count was 3867. That year the water level in October was unseasonably high at over 90%, compared to 58% now. In addition to high counts of Coot, Tufted Duck, Teal and Mallard, totals of interest include 12 Little Egrets (only one less than the Grey Heron count), 325 Wigeon (autumn is always the best time of year now, but even this count is much higher than recent years), only three Ruddy Ducks, and of course the three Ferruginous Ducks. However wader numbers, despite the low water levels, can only be described as awful. Snipe numbers this year are well down; todays count of three compares to 59 last October, when the water level was comparable. Selected totals are given as follows; counts for October 2008 are shown in brackets for comparison: Little Grebe 120 , Little Egret 12 , Mute Swan 115 , Wigeon 325 , Gadwall 375 , Teal 3500 , Mallard 1170 , Pintail 65 , Shoveler 620 , Pochard 820 , Tufted Duck 2420 - a record , Ruddy Duck 3  and Coot 2705 . There were some other birds as well: one Ring-necked Duck, one Greater Scaup, six Goldeneye, four Black-necked Grebes, two Dunlin, three Snipe, one Ruff, one Greenshank, eight Green Sandpipers, one Kingfisher, one Peregrine, 14 Siskin, 17 Redpolls, five Fieldfare, one Rock Pipit and two Brambling. Another murky start, clearing to sunshine for the afternoon. The three Ferruginous Ducks, the Ring-necked Duck and four Black-necked Grebes were seen from Stratford hide, with the following also at the southern end - two Green Sandpipers, one Common Sandpiper, two Ringed Plover, one Ruff, one Dunlin, one Peregrine, 12 Little Egrets, one Goldeneye and the male Ferruginous Duck x Pochard (which was at Barrow Tanks yesterday). The first proper winter migrants to appear in the autumn are usually Redwing or Fieldfare, but this year the first ones were Brambling - four of them in the field at the top of Sutton Wick lane. A male Greater Scaup in Stratford Bay was new today; two of the male Ferruginous Ducks were also present (at one point both together); otherwise just the following to report from Stratford - two Little Stints, one Greenshank, one Ringed Plover, one Green Sandpiper, four Black-necked Grebes and one Mediterranean Gull. Compared to 2009, Snipe are conspicuous by their low numbers this year. All three Ferruginous Ducks were in Stratford Bay today - possibly the first time they've all been seen at the same time from the same spot. Two flyover Grey Plovers and a Rock Pipit (calling in flight) were a couple of good local patch birds; others as follows: five Black-necked Grebes, one Goldeneye, three Ringed Plover, two Greenshank, six Green Sandpipers, ten Snipe, two Yellow-legged Gulls, one Mediterranean Gull, one Little Gull and a flock of 17 Skylarks over. Two Ferruginous Ducks were still present in Stratford/Heron's Green/Stratford/Heron's Green as dictated by disturbance, also four Black-necked Grebes, ten Little Egrets, four Green Sandpipers, nine Snipe, four Water Rails, six Siskin and singles of Whinchat, Black Tern, Greenshank and Wheatear. One of the Ferruginous Ducks was still in Heron's Green Bay today; other birds as follows: one late Spotted Flycatcher (Stratford), one Yellow-legged Gull, two Goldeneye, one Greenshank, one Black-necked Grebe, one Black Tern, four Swallows, five Green Sandpipers, two Snipe and six Water Rails - the last were all on Heron's Green Pool. Three Water Rails and a Snipe were on Heron's Green Pool this evening. The juvenile Red-necked Phalarope was still off Bell's Bush today. The duck flock remained in Heron's Green Bay today, and contained two Ferruginous Ducks, the Ring-necked Duck, the Ferruginous Duck x Pochard and a Black-necked Grebe. There were another three Black-necked Grebes and a few Siskins at Moreton, and four Goldeneye, two Greenshank, one Dunlin, one Redpoll and (overhead) 15 Skylarks. A nice find this morning was a juvenile Red-necked Phalarope off Bell's Bush; funny how they always prefer Blagdon to Chew! A day of two halves - starting with heavy rain and strong SW winds, finishing with sunny skies and a flat lake. This morning at least 1000 hirundines (mostly House Martins with a smaller percentage of Swallows) were milling about low over the lake, but as the weather cleared in the afternoon, a steady southward passage began. Most were juveniles, although there was still a fair number of adult Swallows still coming through. At least one Sand Martin was also seen. Other passerine migrants were three Yellow Wagtails and a Redpoll. Some more birds were four Dunlin, four Goldeneye and an adult male Goosander. The big duck flock was again in Heron's Green Bay, amongst which were 149 Wigeon and the male Ring-necked Duck, which this evening spent a lot of time bothering one of the female Pochard x Tufted Duck hybrids - presumably the closest thing he could find to a female of his species. Close, but no cigar. 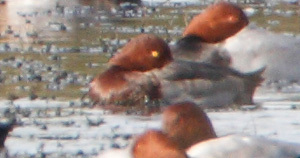 Looking through my pictures of the duck flock yesterday, I noticed the presumed Ferruginous Duck x Pochard. Juvenile House Martin. As the light was pretty good this afternoon, I spent some time taking shots of the juvenile hirundines whizzing through, for no other reason than to get a proper look at them. What buggers they are to see properly with bins; it's not until you see a series of photos that you appreciate just how variable they are. A Hen Harrier flying through Stratford Bay today was the highlight, otherwise it was more of the same; two Ferruginous Ducks and a Ferruginous Duck x Pochard (Heron's Green Bay), four Black-necked Grebes, four Goldeneye, one Whinchat, one Yellow Wagtail, four Dunlin, half-a-dozen or so Meadow Pipits, one Peregrine, a Skylark, and a steady southward passage of Swallows and House Martins, with a few Sand Martins amongst them. The first few Common Gulls of the autumn are beginning to appear now, as well. Disturbance from fishing boats on the main lake today meant that Heron's Green Bay and East Shore/Twycross were packed with birds. Although Chew regularly holds plenty of diving ducks in the autumn, they are normally strewn across Stratford Bay or the East Shore, and are seldom crammed into one place as these were in Heron's Green today. This is a tiny part of a vast swathe of aythyas in the bay today - an impressive sight. Spot the Ferruginous Duck. Awful weather and few birds seen as a result. A female Marsh Harrier at close range in front of Stratford hide today was the highlight, with two Black-necked Grebes, five Dunlin and one Green Sandpiper the best of the rest.